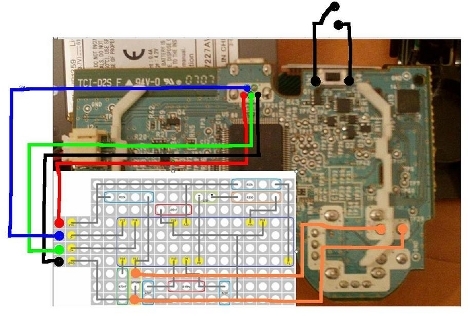 [Hasuky] posted a guide for turning a PlayStation 3 Sixaxis controller into a PSGroove exploit device (translated). Unfortunately you’ve got to crack open the controller and add some parts to get it working. The hack requires a PIC 18F2550 (a chip we’ve already seen used as a standalone PSGroove device), a crystal, and various resistors and capacitors to connect to the controller’s PCB. From there you connect the USB cable between the controller and the game console and boot using the exploit. I dont get why this is better than any other implimentation of the hack, other than its doesnt look like you are using the exploit. plus, would it have been difficult to get focused pictures. This doesn’t appear to be anything other than using the PS3 controller as a case for the microcontroller. Everyone was under the impression previously that this was somehow being done with the stock controller hardware. Going to be a lot of sad pirates. I haven’t really looked into it, but as I understand it, you need to boot the console each time with the exploit device plugged in… This is much easier with a controller, since you’re going to be using that anyway. At least you don’t have to plug your cell phone into your console each time you start it up.. Your controller is probably already plugged in to charge anyway. So…they only use de usb cable? I guess this ups the ante for things to launch PSGroove from. I’m looking forward to someone using a hacked PS3 and a USB file transfer cable to launch PSGroove in the most meta way possible. pirates are the lowest form of scum. reading those ps3 forums sickens me. what a bunch of losers. and would you stop calling this an exploit. it’s not. it’s an emulated stolen dongle that gives you elevated privileges. sony disabled it, and now lets see these hotshots break the newer firmware. not gonna happen, because these are not real hackers(the original psjailbreak guys). the psgroove and etc. are just like script kiddies; no talent, only being dirty pirates. Downside is that pic is always on as long as your controller is on where with a standalone usb exploit you can unplug after booting. I read that this cause the pic to get very hot and kills life and possible ignition. Guy who put this together removed his youtube video and re uploaded it without sound suspiciously after comments were made about clicks of a rear mounted button were made. In essence he seemed like he was trying to make everyone believe he was able to do it with only the sixaxis hardware. To most people, anything involving a circuit board is equivalent to magic. Actually, the ‘hidden’ purpose for this is that the PS3 controller should show up on the USB bus as a proper device which isn’t banned by the latest firmware updates from Sony. Then after gaining access to the USB bus, the PIC can then launch its exploit via the raw USB commands and badda-boom-badda-bing, you still have an operation exploit. To defeat it, Sony will rev its firmware and validate incoming USB data to ensure its properly formatted from a Sony Controller. If the exploit works as I previously stated, I expect yet another update from Sony in a week or so. I can’t believe that keeping it running 100% of the time would cause overheating issues or killing the life of the chip. These chips are used in embedded devices all the time in a variety of applications and I haven’t heard of any issues with chips burning out. I think it’s cool that he put the chip in a controller — most people I know don’t leave their controllers plugged in (they’re wireless after all). I’m still waiting for someone to port the code to some device I already own. Those photos are horrible. How can such a smart fella take such rubbish photos? Don’t you just need it just once to install a pkg-installer? …or use FTP to copy pkg’s. The controller is just used as a USB cable and housing for the device… but it’s still an ironic choice of host! Does the controller not use any of the data lines? Does it just use the usb plug for 5v? With the new 3.5 Firmware, it disabled many Non-Sony USB controllers. So the jailbreak exploit would be stopped. Since you are making a Sony product capable of doing the same thing, it will be a lot harder to stop. Since the exploit has come out there are many package files that many people are using. Such as being able to buy new games and being able to play them on lower Firmware than was is installed on the disk. Pretty soon, the community will be able to point the PS3 to other websites to get modified updates and other PS3 goodies. this is what I thought, and Slashdot killed my reply about it. if the ps3 uses the usb like the xbox360 then all the usb cord does is power the remote as it still sends everything by wireless (bluetooth?) So nothing is really going on here other then some kid that connected some wires to some traces for power. The USB tethered xbox 360 controllers do not operate over wireless t&p. Now the plug and play charge kit for wireless controllers IS just a power cord, but thats obvious. I do not own a ps3 so I don’t know whether or not they have USB-only devices or not. Although not quite crazy that you do not buy that extremely expensive controllers, and goes for the cheap but often false excellent working controller. Sony Warns you now really. So they will block the controllers and they say that these versions may explode. Recent firmware update 3.50 is now blocking unlicensed controllers. Sony warns, when no controllers unclear stores now. I haven’t read the article… how does he connect both the pad and the “dongle” to one USB connection? Is the pic also emulating a hub? Maybe it is just using the cable and the pad has to use BT as if it was untethered. @Jorge: I don’t think Sony makes any USB-only pads, but I think there are 3rd party ones. My opinion about this whole situation is that the makers of the original device did a disservice to the (eventual) PS3 homebrew community by giving Sony a chance to patch around this before it was used to find a more permanent exploit. I don’t condone piracy, but I *really* want full access to the PS3 hardware (without paying thousands for a dev-kit or giving up access to PSN and the latest games). To pair a PS3 controller to the console, you have to plug it in and then press the PS button on the controller, so that would suggest some form of communication down the cable. @rburgandy: That was the initial theory. Once the source was released, it was shown to not be the case. This *is* nothing more than a case mod, but to me it makes alot more sense than using your cellphone or calculator. I mean, the controller will always be with the console. The picture shows the bread board layout. Does anyone recognize what tool was used to lay it out? Does this work on 3.50? Has any1 tried it yet on the latest firmware? Grab them before they are gone again.